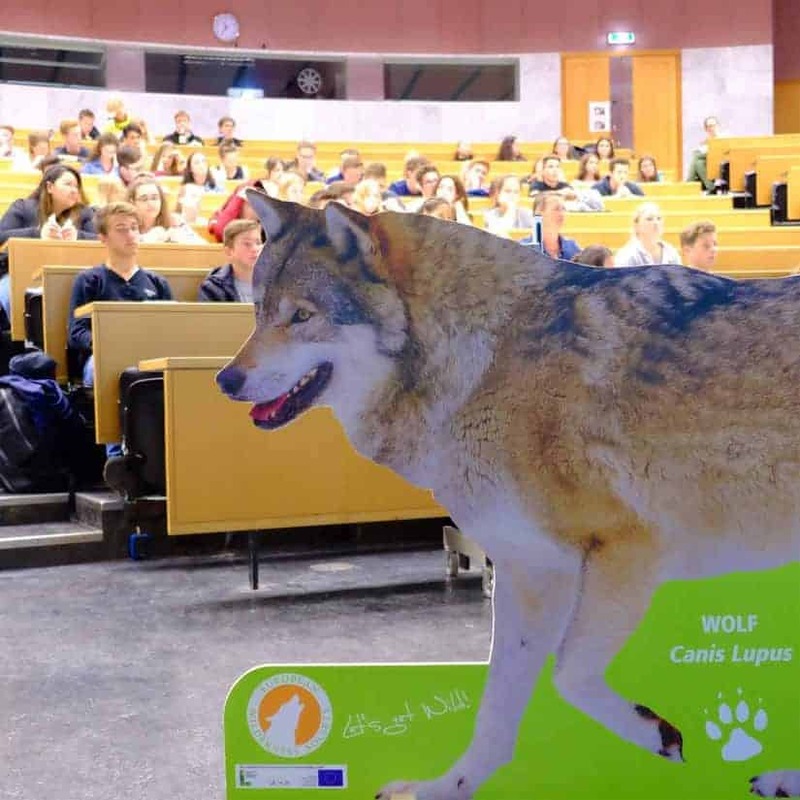 Approximately 100 students from 5 schools all over the state of Salzburg listened to a presentation about the wolf and its comeback to Austria. The SchülerUNI is a project of the University of Salzburg to give high school students the opportunity to get a glimpse of university life. 3 to 4 times per semester Sylvia Kleindienst from the Kinderbüro of the University of Salzburg organises lectures and discussions to various topics. Topics range from “what advertisments promises” to autonomous cars and the currently heavily discussed topic of the comback of the wolf. The organises try to offer a balanced range of topics presented by young scientists as well as established university professors. You can find a short posting and a link to pictures of the event here. Our wolf expert Gudrun Pflüger held a 30 minutes long presentation about the wolfs comeback to Central Europe. She talked about the biological facts of the wolf and the reasons behind its comeback. The talk also dealt with research methods of wildlife biology and possible ways to coexist. After her presentation interested students had the opportunity to ask questions. How should you react and behave if you encounters a wolf? Is the wolf going to influence hunting in Austria and if yes, how? Gudrun’s various impressive encounters with wild wolves, in particular in Canada, where the topic of even more questions. At the end of the event Dr. Leopold Slotta-Bachmayr, head of the wolf project of the Naturschutzbund, asked the audience to participate in a quick survey about the wolf’s comeback. Yes, the wolf has a place to live in Austria! or No, there is no place for the wolf in Austria. About 80% of the around 100 students voted in favour of the wolf.